If you haven't heard of Make Up Revolution by now, well how not? It's been all over the blogging world recently…and through blog posts and other bloggers is exactly how I found this brand. I've been lusting over many lipstick colours & in need of some new eyeshadows for some time now, and I thought this was the perfect opportunity to trial the makeup revolution range, with lipsticks £1 and pallettes at £4, after reading and searching through so many blog reviews and lots of enabling from my blogging friends on twitter, last saturday afternoon I made my first order. The pallettes I ordered were the Iconic 3 & Hot Smoked. After hearing about how the Iconic 3 was practically identical to the Naked Pallete 3, well for a girl who can't afford to justify £37 on eyeshadow, iconic 3 was first in my basket. I've read so many reviews and seen many swatches of a comparison between both pallettes and although I can't show you the same, so if you're wondering give it a little search and you'll see how similar they are. I've been needing a new pallette of neutral colours for a while now, and I love the pigmentation of each colour, with a variation of shimmer and thickness of the colours. Starting with rose colours, to a light brown toward the deeper brown shades, perfect for the days when you want a more natural look, while working an awesome smokey eye at the same time…I can't wait to start using this more. I'm kind of like an addict when it comes to smokey eyes, not sure what my attraction is…maybe it's the inner rock chic that I let come to surface every now and then. But once I found a few smokey palette I immediately wanted to try them all, but after being told that hot smoked needed to be mine, well that again went into my basket. Again at £4 you can't really resist temptation. I love that each colour has the hint of darkness in the colouring, yet still looks flattering with the shimmer, perfect for nights out & evening wear, it's perfect for throughout the year if you ask me! The colours that drew me in were definitely the purples & blue, to help create a smokey eye with the darker browns & greys, they add a hint of colour…so I don't end up looking like I'm back in the goth days. Now the most exciting part of my order is the 7, yes SEVEN lipsticks I purchased. For a while I've wanted to try these lipsticks, with lots of positive reviews online, though I was a little disappointed to struggle finding swatches or seeing them on. When lipsticks are £1, my immediate thoughts are WOW! and will they be the right texture? I love colour filling lipsticks, and tend to turn my nose on glossy one where the colour hardly shows. So I did my research (as best I could), though the website does have examples of swatches for some of these, so you can sort of an idea. I have added a few coats to my lips for a fuller effect, though I think I made the right decision with the colours I went for. I've wanted to add some new colours to my growing lipstick collection & what better way to try then £1 lipsticks, so I picked a variation of colours, and after a few uses I've become more obsessed. First use I was a little disappointed that one coat didn't feel enough, and that they were definitely glossy effect. Though looking at my picture I'm warming more and more to each colour. Knowing that for me I need to add more to my lips for me to be happy. 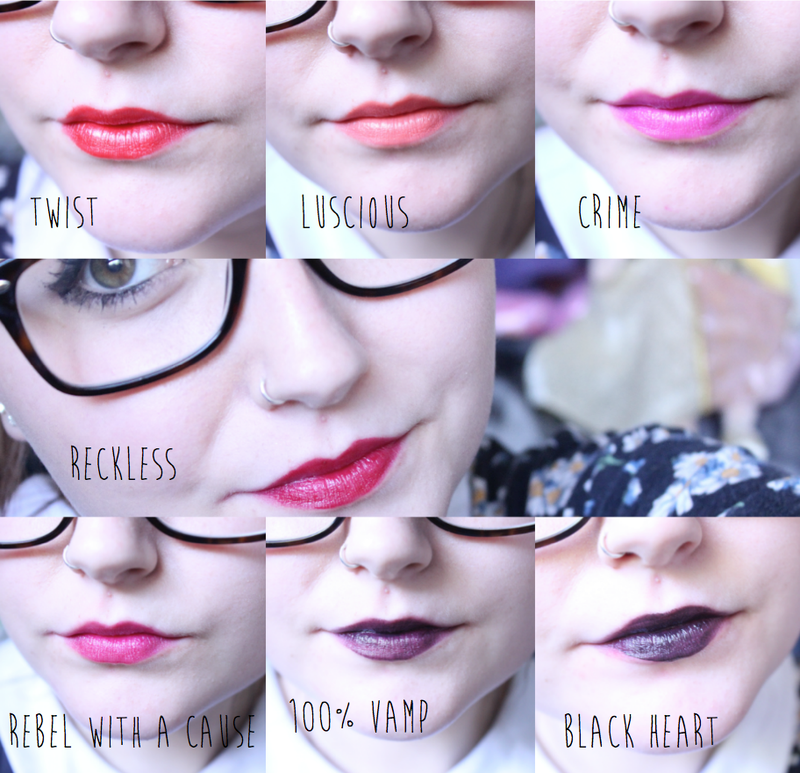 Sadly I'm still struggling to get along with 100% Vamp & Black Heart, as they are so similar (but bought in a collection for £2, with rebel with a cause)…only because I don't feel they're pigmented enough, and that they're way too glossy for an overall 'gothic' dark lip look. I was also hoping that Crime was more of a vibrant hot pink, but still it gives a very 'barbie' hot pink effect over all, so I can't be too disappointed…It's just these three colours seem to smear and wear off a lot quicker than the rest. Although I'm still hoping to fall in love with certain colours, I can't fault the rest! Some are still too glossy for me, but I also find them to be at the standard as higher quality lipsticks...does that make sense? My favourite so far being 'twist' with reckless and rebel with a cause following not too far behind, these were also similar colours to some I'd been eyeing up in mac lately…so to me £1 alternatives are much better!? These three colours in particular also have a closer matte finish compared to the rest. Though I'm completely thrilled with my order, and will be using these non-stop till they run out, my first impression still feel very mixed…but for the price I really can't say much!? I can't wait for make up revolution to head into stores…because buying before trying, isn't usually my way of shopping…well not anymore! Overall I'm really impressed and hope to post more of a review on each product once it's had more use. Have you ordered from make up revolution yet? Or are you at least tempted now? This brand has been getting so much coverage lately! They look pretty great for the price! I love all the colours - the eyeshadows look so good! I've heard so much about Makeup Revolution, I can't wait for payday, going to stock up on as much as I can! Great post - I love all the swatches you have posted - can really see what the colours look like which makes it so much easier to decide! Some great colours, right? I'm in loveeee, hehe. I've had the same opinion on them before and after they arrived! For £1 I'm really impressed and the more I'm using them, the more I'm liking them. The texture and the longevity were my initial doubts with them too. I'm in love with them all and I definitely recommend the eyeshadow palettes, I love these colours! I haven't had the chance to use the eyeshadows too much yet, but I'm really excited to! I can't wait to use them more & those two lipsticks are fast becoming favourites of mine! Ah you should do! It's good quality for such a good price. I'd noticed not many others had done the same & I like seeing what colours look like before buying aha. I've been using the Iconic 3 so much lately, I love the colours together & they're very long lasting! ?…Though I do want to try them with an eye primer!